TheAngrySpark: Dinosaurs vs Aliens, FIGHT! Well, this is interesting (if nothing else). Dinosaurs take on a rampaging alien menace in Barry Sonnenfeld and Grant Morrison's motion comic - Dinosaurs vs Aliens. Sonnenfeld (Men in Black series) has been making films for a good long while, but I don't think I've ever heard his name associated with a comic book before. So it would stand to reason then that when he had an idea for a book (of sorts) he went to one of the biggest names in comics - Grant Morrison. Morrison has been on fire in recent years with his runs on some of DC comics biggest properties like Batman and the New 52 Action Comics (Superman). He's a controversial guy and honestly, you either love him or... not. Either way though, there's no denying his stardom. With Dinosaurs vs Aliens, Sonnenfeld had the idea for a prehistoric alien invasion- and just how those off-worlders would fare against the planet's dominant lifeforms of that age. 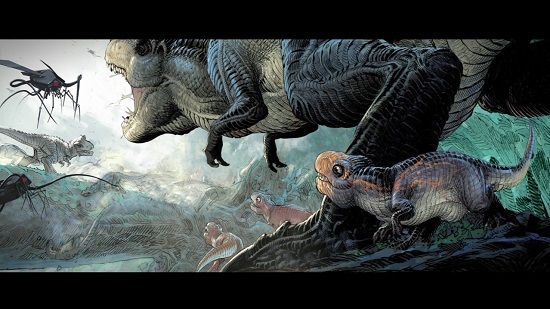 Dinosaurs vs Aliens is a motion comic (getting to be a crowded field these days), and looks to have some big, bold artwork to accompany the big, bold bite marks the aliens are more than likely going to end up with. Look for Dinosaurs vs Aliens to debut on Yahoo!Screen on July 23rd.